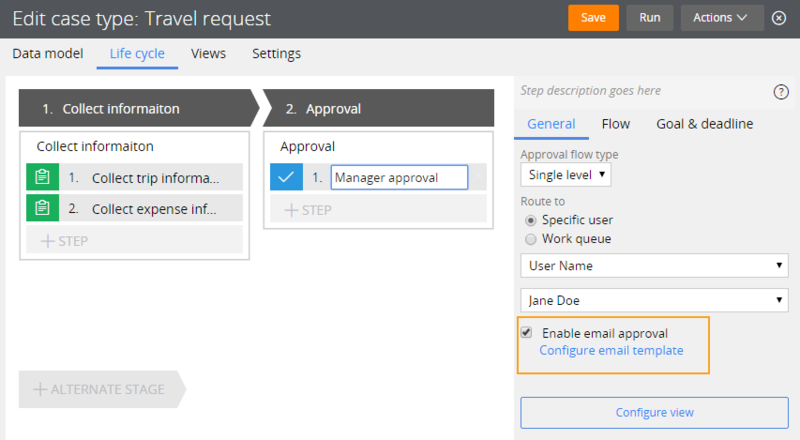 You can quickly enable email approval on approval steps in case types so that users can reject or approve tasks without logging in to the application. You can also customize the email that is sent to recipients. In Designer Studio, the Enable email approval check box, in addition to appearing on the Approval shape, also displays on the General tab when you click an approval step and route it to another user in Case Designer. You can quickly enable email approval when you design a case without switching to Process Modeler. In addition, by clicking the Configure email template link, you can quickly access the correspondence rule that you configure to customize the email that is sent to recipients. You can add or remove the form fields that are displayed in the approval email by clicking Viewsin Case Designer and selecting the Reviewview. If an attachment field is included in the view, and an attachment is submitted with the case, the attachment is also sent with the approval email. The emails that users receive to reject or accept a task in a case contain a link to the case. Users can click this link to quickly open the case for which they receive approval emails. 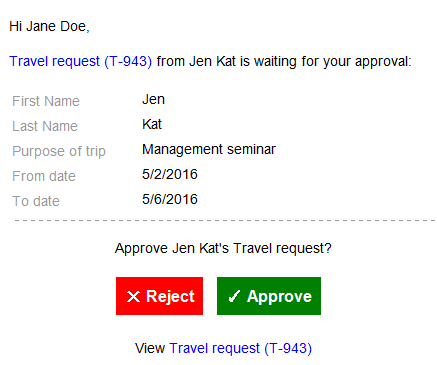 When users approve or reject a case, they send an email reply to the email address from which they received the email. They can also enter text in the email reply. Comments that users provide in the email reply are posted as comments in Pulse within the context of the case.